WHY IS MY FACIAL HAIR BECOMING MORE COARSE? For most women, after 35 - 40 years of age, our hormones are changing. Our facial hairs become coarser on the lip, chin, and neck - similar to a young teenage boy. Tweezing or waxing causes these hairs (face, neck, breast & abdomen especially) to regrow more quickly and to become darker, coarser and more firmly rooted. Each time a hair is tweezed out of its follicle, a good portion at the bottom half of the follicle is torn out. The damage is not sufficient to prohibit future growth or kill the hair, but it is enough to cause the follicle to reconstruct itself a little sturdier with a better developed capillary system each time (which means stronger, thicker hairs eventually). 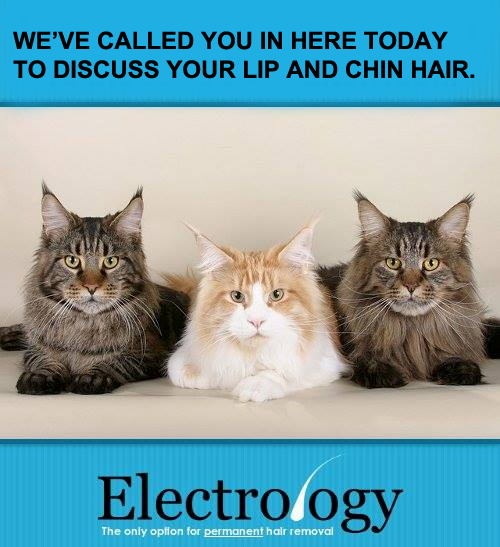 Book an appointment and get rid of those unwanted hairs. Men, also experience hormonal changes after 35 - 40 years of age and the male beard becomes stronger & fuller than it was at 25 years of age. The hairs in the nose and ears begin to become more coarse as the beard thickens and broadens in the cheek area. 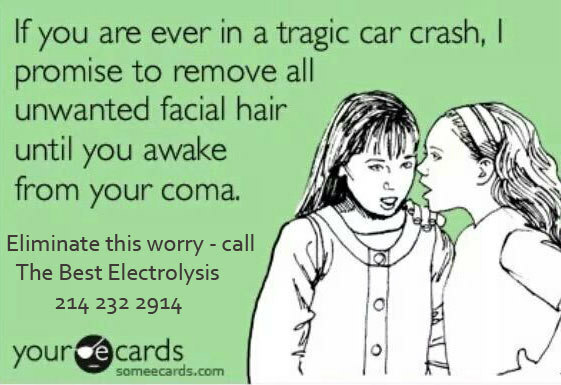 Electrolysis can make those ears hairless and smooth again and we can permanently remove any unwanted hair growth in the beard area. Do you have a mustache or beard? Do you have a standing appointment for waxing each week or every two weeks? Then, you probably have a moustache or beard. IF YOU DID NOT TWEEZE/WAX/THREAD those hairs on your lip or chin? What would you look like in a day, a week or a month? Using simple math: there are approximately 615 hairs per square centimeter on our lip, chin & neck (a centimeter is approximately the space on the tip of your index finger). BUT...I only have one or two hairs on my chin/lip that are coarse ---- NOT REALLY! 2 hairs plucked a day x 365 days a year = 730 hairs - YIKES! This video visually illustrates the hair growth cycle and explains how and why hair doesn't grow at the same time. 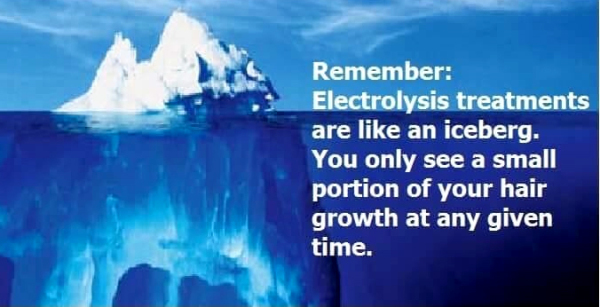 Electrolysis with lots of good information. Do NOT expect bruising as mentioned in video. Women's humor about plucking, waxing and threading those problem hairs on our chin, lip, etc. It's a universal problem for all women. 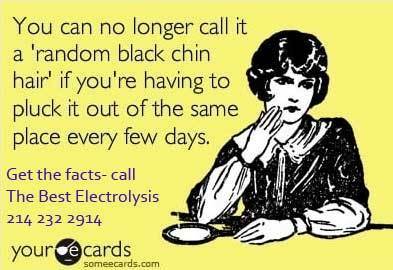 BTW Ladies - Electrolysis IS the solution to this problem. The Apilus xCell offers many patented modes of treatment and comfort for all kinds of hair which are unique only to Apilus. NOTE: Constantly touching your skin can trigger breakouts and other skin irritations. A really interesting video that illustrates how much hair we have in the facial area - Men and women have basically the same amount of hair in the facial area - the male beard is hormonally thicker at a younger age than women. This person plucked out all of his beard and moustache hairs (OUCH !) in 2 days and counted each one - 15,744 hairs at the time of clearance. NOTE: this amount of plucked hairs is a small fraction of the total amount of hair that is actually still growing in the beard and moustache area. He photo-documents new hair growth for the next 26 days. The new growing hairs are NOT the plucked hairs - as it takes a plucked facial hair 6-8 weeks to regenerate & grow back on the surface of the skin.